A GROUP OF Irish nuns and priests of varying denominations have created a YouTube video detailing how they first found their calling to holy orders. The video has picked up some 5,000 views in advance of February 2, the World Day for Consecrated Life, a designated day for the Church around the world to reflect on the vocation to religious orders. The sincerity on display in the video is fairly striking as you can see for yourself below. The nuns, brothers and priest – aged from 28 to 79 – explain their life’s work and the choices they have made. Among the five interviewees featured is Br. Conor McDonough (28), a trainee Dominican priest from Galway. McDonough’s youth is in stark contrast to the image of an aging Irish priest population, one of the themes of the video. “I wasn’t sure how this decision would affect my relationships with family and friends but, in fact, I found that it has deepened them in all sorts of unexpected ways,” he says. Sr Monica Boggan, a 32-year-old woman from Enfield in Meath speaks passionately about what she loves about being a ‘Red Nun’. A Redemptoristine nun in Drumcondra, she said she knew she had a vocation from her first weekend visit to the enclosure. “There was a tremendous peace and joy in my heart and I felt the Lord said you belong here with the sisters,” she said. Sr Louise O’Rourke is currently ministers in the Archdiocese of Dublin as a canon lawyer and as the Assistant Vicar for Religious. “Often in religious life, people will talk about what you’ve given up but I like to think of it as ‘taking on’ and being given a lot,” she says in the video. Elsewhere, Cork native Fr. Alan Neville – a former commerce student – suggests that the appetite for a calling among the Irish population is greater than you might think. I think there’s a lot of people interested in a vocation or religious life, but there’s just a fear about taking that first step. “Really, it’s about exploring where God is calling you, just having the courage to take that leap of faith,” the 39 year old added. According to the Vatican’s most recent figures (2012) there are close to 10,000 people active in religious orders in Ireland – 7,000 sisters, 600 brothers and 1,800 priests with a further 2,800 priests attached to dioceses. One thing’s for certain however – the Redemptoristine nuns featured in the video need to brush up on their table-tennis rules. This three-sided table madness will surely never catch on. Email “VIDEO: Five young men and women explain why they became priests and nuns”. 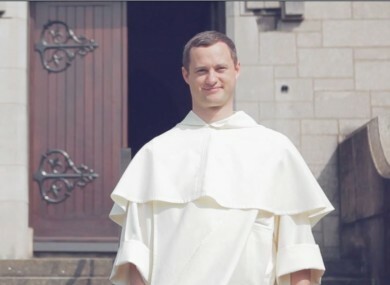 Feedback on “VIDEO: Five young men and women explain why they became priests and nuns”.